Today we’d like to introduce you to Glenn Koenig. I got started about five years ago when I began thinking about little messages to put on pins, stickers, and T-shirts. It was during a rainstorm and my mind was full of ideas. So I thought, ok, this is a rain of messages falling down from the sky into my head. Most of my messages were deep and thoughtful, so marketing was hard. Most people prefer messages that are funny or snarky in an ironic way. The rest buy sports logo stuff. So the business kind of sat there not going anywhere fast. Then I started writing a book about my gender identity and realized that I might as well publish it under the Message Rain name. After all, my initial ideas for the book seemed to come from the same source. Now, after three years of concerted effort, the book, “a man wearing a dress,” is published and available everywhere. Now my energy is going in two directions. One is the promotion of the book by holding readings, book signings, issuing press releases, and the usual stuff. The other direction is to work on exploring other media, such as short videos online, live performances, etc. I want to keep with my original mission of promoting love and harmony in the world, among us humans, and with the natural world around us. Not too ambitious, right? My main struggle originally was finding a good fit between what I wanted to say, and what others would understand and be interested in. That’s the true essence of marketing. Marketing is understanding what people want; what they are willing to actually buy, and then doing that. It’s easy to have ideas. It’s easy to have other people tell you that your ideas are “great.” But if they don’t ask, “When will that be available?” or “When can I get one?” then it’s not likely to be a win-win. So, as you know, we’re impressed with Message Rain – tell our readers more, for example what you’re most proud of as a company and what sets you apart from others. Right now, the main product is my first book, “a man wearing a dress.” I’ve had limited sales of my T-shirts that say, “I don’t blame you” on them. And my “please” stickers (too put on obnoxious signs) are “sleeping” in the sense that I have to find a way to promote them better. There is a lot of creativity and new thinking going on all around. People are trying new things, showing or performing new art, and so on. And there’s an interesting mix of art and technology, which is better than either one alone. In the middle is the respect for diversity. 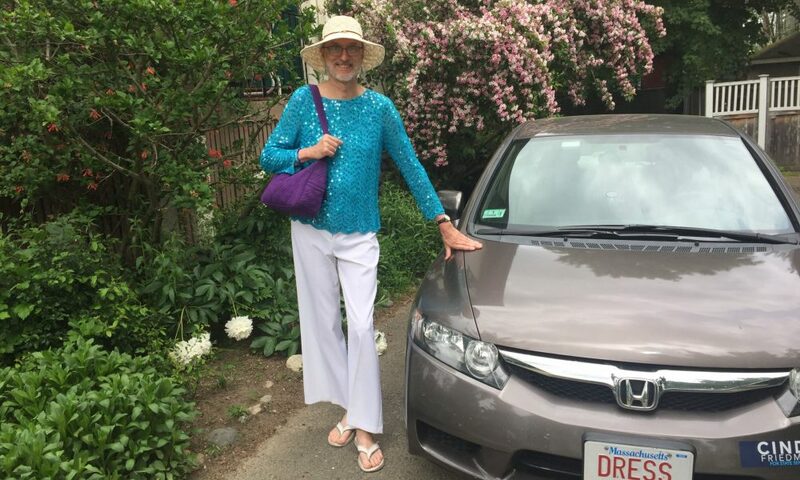 In some ways, the greater Boston area is an amazing place to walk around on the street wearing a dress and a trim beard at the same time, as I have often done. I often get complements spontaneously from strangers. That feels great! On the other hand, there is a sad legacy of racial intolerance, as evidenced by the segregation of neighborhoods and suburbs that persists, even today. On the downside is the cost of living. Wow! It is expensive to live here, even at a so-called “middle class” level. And even with the high costs, the condition of our public transportation is kind of sad. We just can’t seem to get it to work more smoothly. A man wearing a dress, $22.00 list.